Announcement Designing custom dog collars, leashes, and harnesses that meet the needs of my customers and their fur family is my priority. I offer a variety of patterns and colors, and personalization can be added to just about everything in my shop. Please take a look around, and if you don't quite see what you're looking for, please message me! Custom orders are always considered! Designing custom dog collars, leashes, and harnesses that meet the needs of my customers and their fur family is my priority. I offer a variety of patterns and colors, and personalization can be added to just about everything in my shop. Please take a look around, and if you don't quite see what you're looking for, please message me! Custom orders are always considered! Very nice leash that’s well made. So great that you can have it personalized with your pets name & number, if you choose to. Seller was awesome with customer service & communication. I wanted a few extra inches added to the collar so my pup wouldn’t outgrow it too soon, she was very accommodating on my request. She also made it a bow tie instead of a flower. I love being able to have the collar personalized with my pets name & number too. Very cute collar, I love the print. It’s so beautiful! Came on time (even a little early). Love this collar! We love receiving customer feedback and photos! This is Salem, sporting his new plaid harness and matching collar! Isn't he the cutest? A photo of my sweet girl, Lucy; the inspiration behind my shop! Handmade with beautiful, top-quality fabrics. Leashes can be purchased with any collar or harness order! Keep your dog safe while riding in the car. Our custom seat belts are perfect for all sizes of dogs. Customize any order with personalization for only $10. 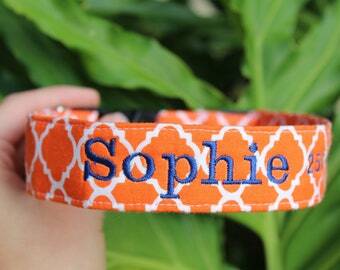 Choose to have your dog's name and a phone number embroidered! A girl and her Boxer! In 2012, I adopted my Boxer, Lucy, who instantly became my furry little side kick! I began sewing around the same time and decided to make Lucy a collar since I couldn't find one I liked in local stores. My friends and family as well as complete strangers would stop and ask me where I got my collars. When people started asking if they could buy collars from me, I decided to start a small side business. Since then, my company has grown extensively! I attend many farmer's markets and craft shows throughout the year, as well as dog agility trials, festivals, and other events. Last fall, my company won the People's Choice award at one of the largest Fall Craft Shows in Northeast Florida. In addition, if you happen to live in Florida, you can find my collars in both locations of Bark Boutique in Jacksonville, as well as Woof Gang Bakeries in Winterpark and Windermere! I'm always excited to grow my company, but more importantly I'm excited to create high-quality, stylish items that please you and your four-legged friends! I have a passion for designing unique pet items! My four-legged animals are my fur kids, and biggest inspiration behind my growing company! Please wash your dog's collar on gentle cycle with like colors. Do not place in dryer; instead you may line dry.